From his position behind home plate he can easily scan the whole field and keep an eye on the dugout. No, this is not a major league umpire we are talking about. 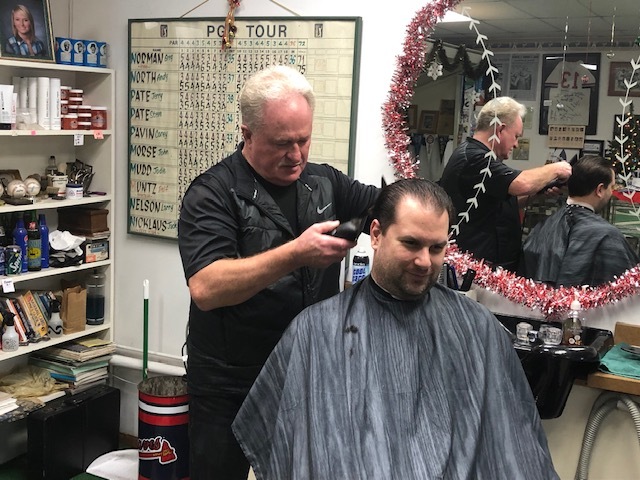 He is Doug Shaffer of Doug’s Sports Cut on Route 33 in Goshen. Doug is Owner, General Manager, Barber and chief raconteur about all matters related to sports and life. His unique vantage point is behind the customer’s chair which is located at the base of a miniature infield built into the floor of his shop. And there always seems to be someone perched in that chair getting a cut, a trim or a whole new do. Doug’s Sports Cut has been the place where guys have come for a trim and some chatter for years. Some started as children and continue as their hair thins out and grey starts to show. They now bring in their kids and the tradition continues.